At the start of the 2017 General Session of the Utah State Legislature, it looked as if a lot of emphasis would be placed on Utah’s special districts. The interest could have brought wholesale changes to the way they conduct business. The session proved to be one for the record books: An unprecedented 1,272 bills came under review. Representatives from the Utah Association of Special Districts and friends of districts throughout the state monitored activity at the Capitol and kept legislators informed on the latest developments. As the session moved toward its close March 9, lawmakers introduced additional legislation including two bills that have some in the industry “up in arms,” Finlinson said. Another proposal, Senate Bill 94 from Sen. Lincoln Fillmore, ended up being replaced by a substitute bill that addressed concerns raised by Utah’s special districts. It struck a mutually agreeable balance. 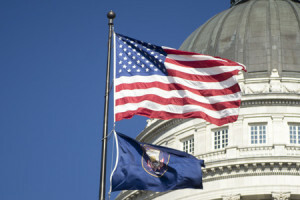 SB 94, which originally did not include CUWCD, aimed to correct what the Republican from South Jordan saw as taxation without representation. As it is worded now, the measure includes all special districts, including CUWCD, in asking appointed board members to attend a public meeting of their appointing entity as an agenda item when a tax increase is under consideration. They would explain, through an informational report, why extra funding is needed. The substitute bill has passed the Senate and the House. Once it is signed by the governor, it will go in effect Jan. 1, 2018. Two recently introduced bills, SB 271 and HB 444, “will affect the entire water industry,” Finlinson said. SB 271 deals with irrigation issues, addressing the ability of irrigation companies to require developers to replace existing ditches and canal infrastructure when developing property the ditches run through.. “There’s always a lot of interest there,” she said. “It is an important issue for both the irrigators and developers and will be thoroughly vetted during the interim process.” HB 444 would prevent a specific state agency from acquiring water rights. Fortunately, both will go before the Executive Water Task Force and other review boards before coming under serious consideration. The process can take close to two years to complete. “It gives everyone a chance to discuss it away from the pressures of the general session,” she said. Keep watch on our CUWCD social media channels for more to come on S.J.R. 11. It ends the legislative season on a high note.